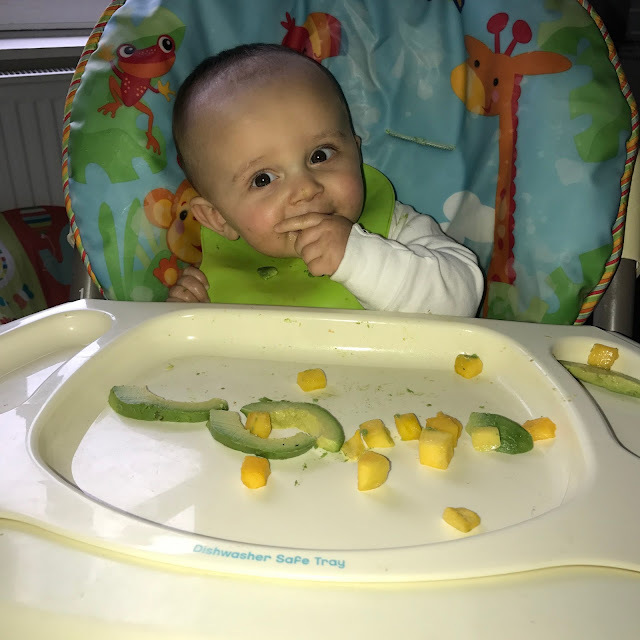 Mylo is now 9 months and we’re well into the whole ‘baby led weaning’ stage - it’s something we did with Millie and it worked really well so we knew we were going to do the same thing with Mylo too! Although it’s quite a scary thought for a lot of new Mums, we find Baby led weaning so fun and a great way for your baby (and you, sometimes!) to explore new tastes, different textures and also get to grip on their hand/eye co-ordination. 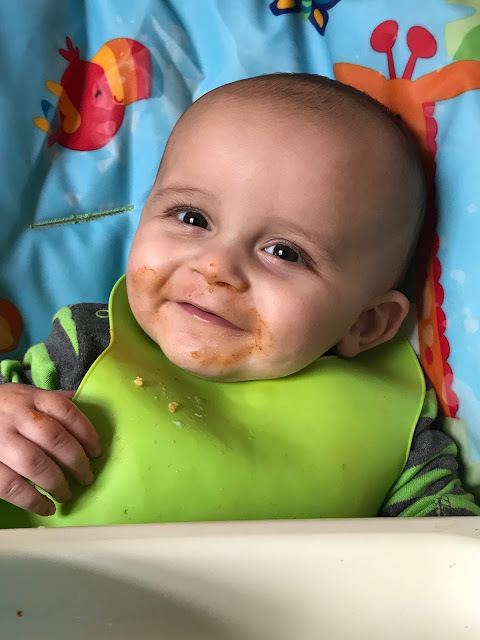 We use a mixture of baby led and spoon fed, depending on what he’s eating, but we’ve found the older he gets, the more independent he is too and also, the better he can eat his food meaning he takes the lead with most of his meals now. 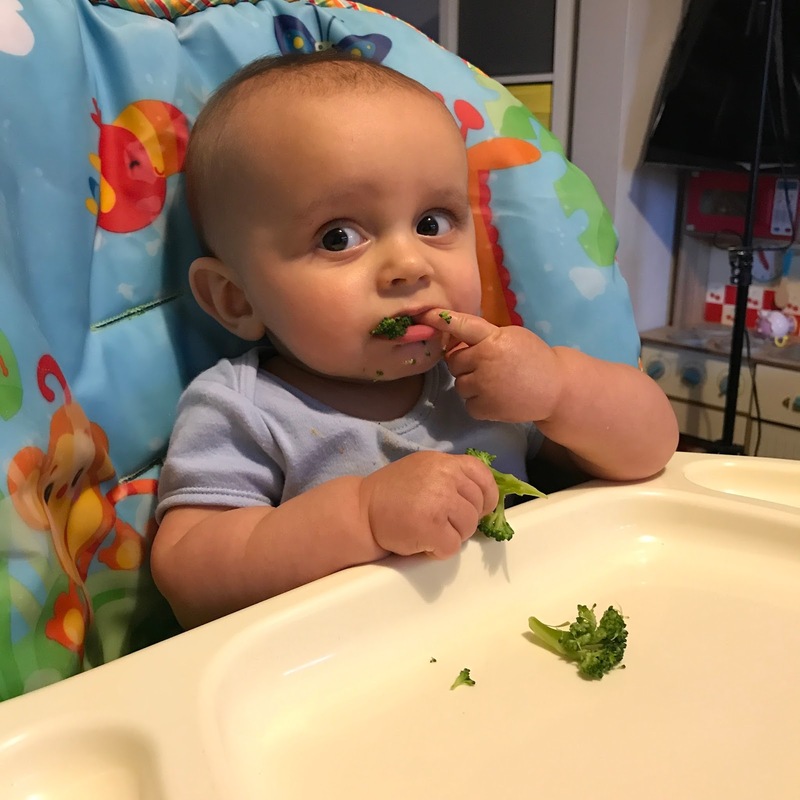 He also eats such a wide variety of things and so for anyone starting out or wondering what to give your baby, this post should come in handy for some of those un-answered questions or worries! So we started weaning with Mylo at around 18 weeks (4.5 months) because he took to his milk so well, it just seemed like the right thing to do. The guidelines state that your baby should be 6 months old but it can start from 4 months depending on your baby - please remember that all babies are different and you should do what is best for your baby. 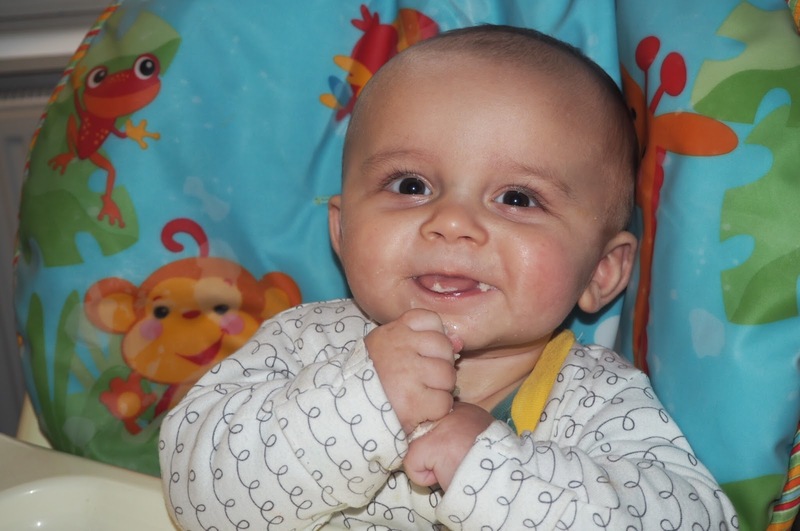 At around 8 months old, we had a good, established feeding routine and started to properly incorporate everything he needed such as dairy and protein. We still spoon fed him at times, for example if we jar fed him a meal or had puree, we did it because it was easier but he always had something to eat himself afterwards. This is pretty much what each day looks like. We had a solid routine nailed since he was around 6 weeks old and we stick to it whenever we can (we notice a massive difference in his mood/behaviour if we don’t!) and it works perfectly for us. I’m not saying to follow this completely, but find something that works for you and stick to it! It makes life so much easier knowing what’s going on each day, especially if you are planning on putting baby into childcare in the future. Vegetables (cook until soft and cut into pieces large enough so they can hold) - Carrots, parsnip, potatoes, broccoli, cauliflower, baked beans, pasta with sauce, fish (cook until soft), rice cakes, cucumber chunks, oranges, pear, blueberries (squish them first), jelly, yogurt, cubes of cheese, fairy cakes, biscuits, wotsits/skips. Of course, there are so many more foods you can try - these are just items that are easy and quick to make and keep and things that Mylo eats really well. Pasta is a favourite at the moment whether it’s tubes or spaghetti, he loves it! We also make our own jars of food if I know we’re going to be out at some point in the week but I simply cube vegetables and add some small pasta shapes, add a little passata and some chicken or tuna and portion into tubs or jars. We buy Heinz jars as they’re usually on offer and wash these out so that we can re-use them! 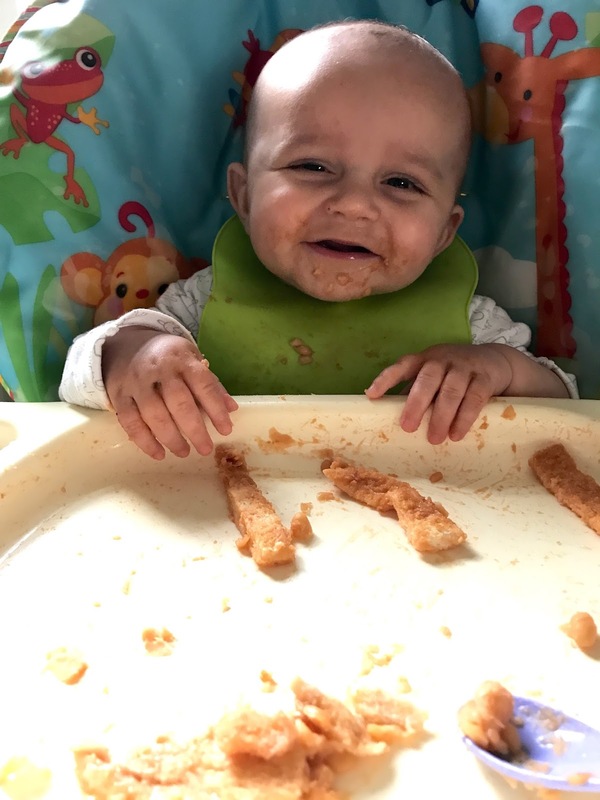 I’m not against spoon feeding or jars as sometimes it is usually quicker and cleaner so it’s great to have the option but I think allowing babies to explore food, they are more likely to be good eaters when they get older. Millie loves everything, she isn’t put off trying new food as she ate whatever we did when she was younger - she can actually eat a chunk of Lemon now too because we used to give them to her as a baby haha! So if you’re weaning your baby and looking for ideas, I hope this has helped! Don’t be scared to have them try something new - as long as it’s soft enough, most babies will mush most things up and they also have a really good gag reflex so will cough something back up if it’s still too big! Full-Time Mum or Full-Time Job?